A blog all about Lily's Sylvanian Families and what they get up to in the village of Little Chestnut! 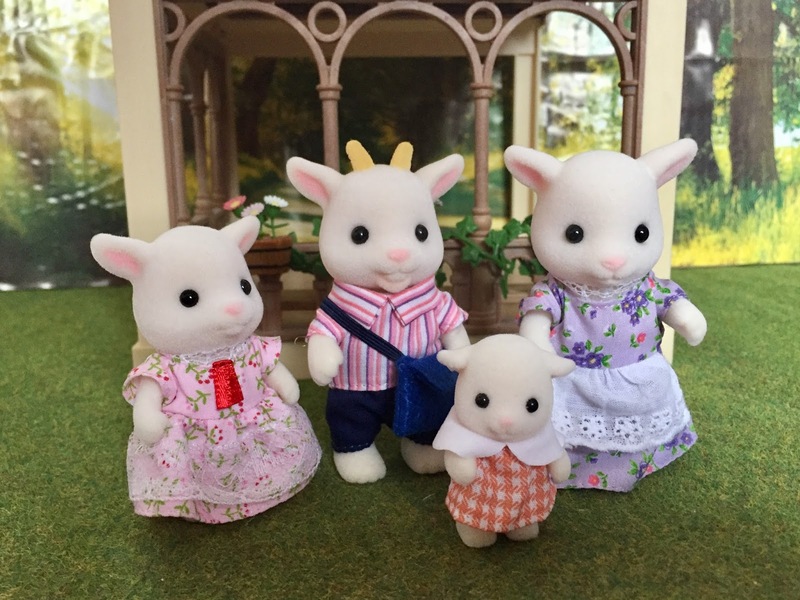 I finally purchased the Cottontail Rabbit Family, so the Cottontail Grandparents are very happy to be reunited with their family at last! 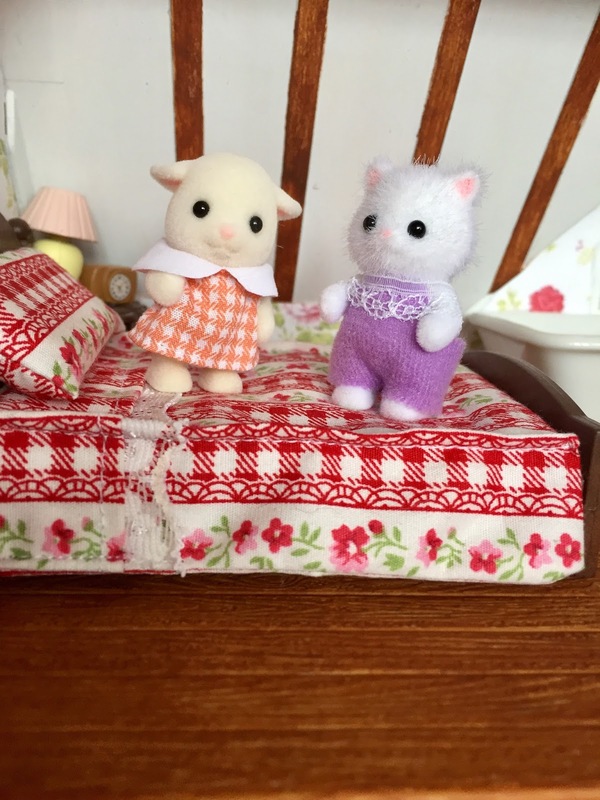 I also mentioned a few blog posts ago how I am in love with the Brightfield goats, so I had to get those! The baby goat is too adorable! 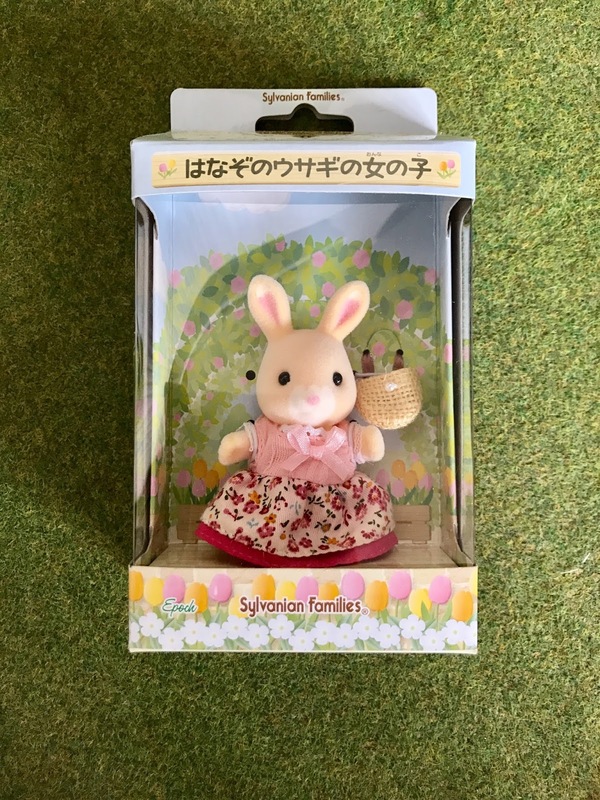 I think the most exciting and most anticipated purchase has to be the Wildflower Rabbit sister!! 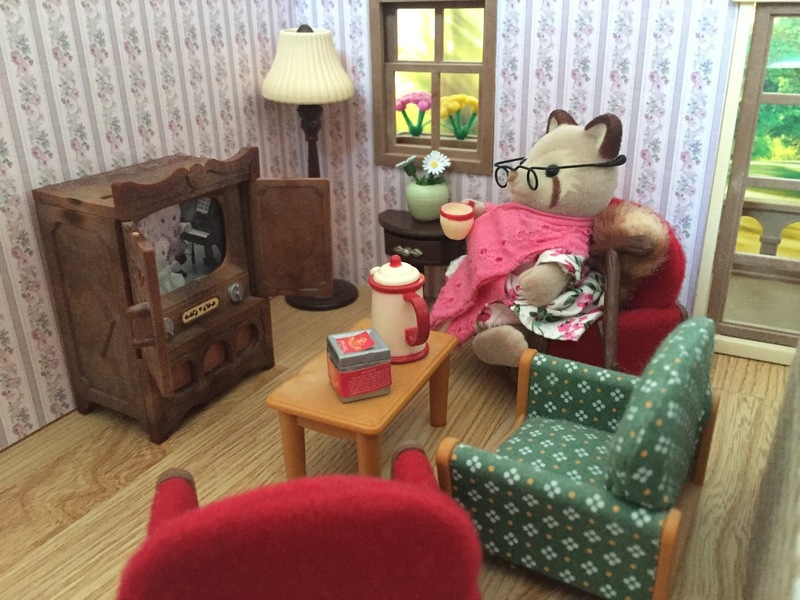 Quincy Marmalade had an excellent week; reading the newspaper, watching his choice of television with Mildred Mulberry, playing cards with Leonard Macavity, all accompanied with unlimited tea and homemade biscuits from Mrs Hazelwood. To bid Quincy farewell, Mrs Hazelwood prepared a special meal for all of the residents. "Mrs Hazelwood, how kind you are, this is delicious!" Quincy Marmalade exclaimed. The others looked at him in shock - a week ago they could never have imagined grumpy old Quincy with a smile on his face! Carmen Cottontail previously could not stand Quincy Marmalade and his endless grumbling, but now she considered him a good friend. 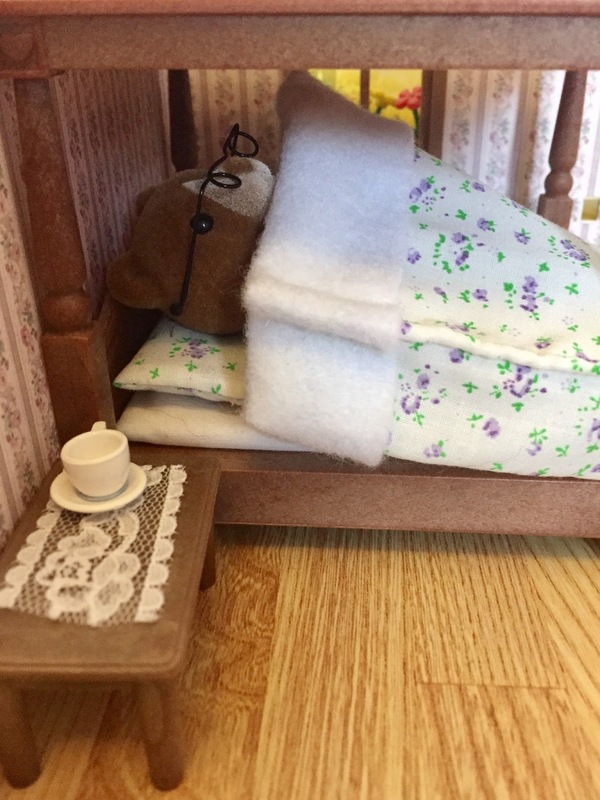 That night, as Quincy stretched out in his very own four poster bed for the last time, he thought about the wonderful week he had had. Possibly the best week since before his dear wife, Clementine had passed away. 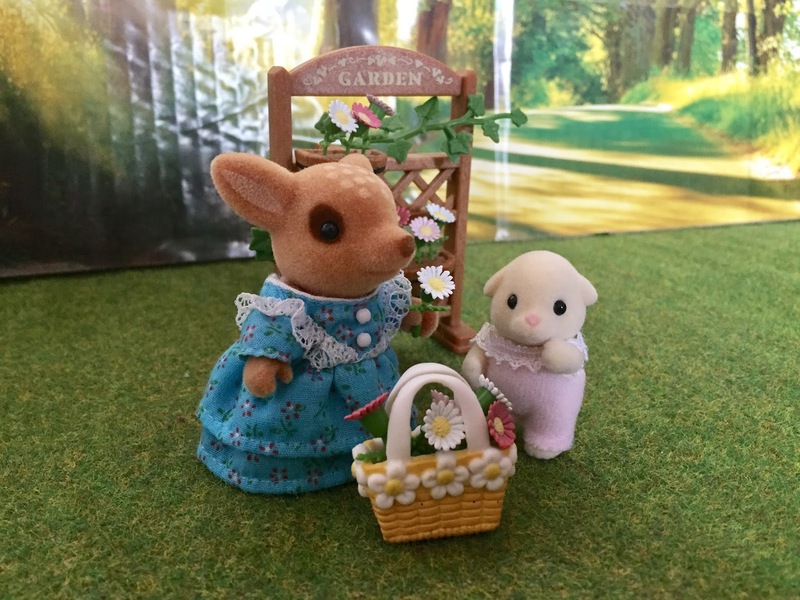 The next morning, Margot Marmalade arrived to collect her father. "I'm not coming home Margot" Quincy Marmalade said, dramatically. Margot nearly choked on her tea. "What do you mean, Father? Of course you're coming home!" Margot said, insistently. 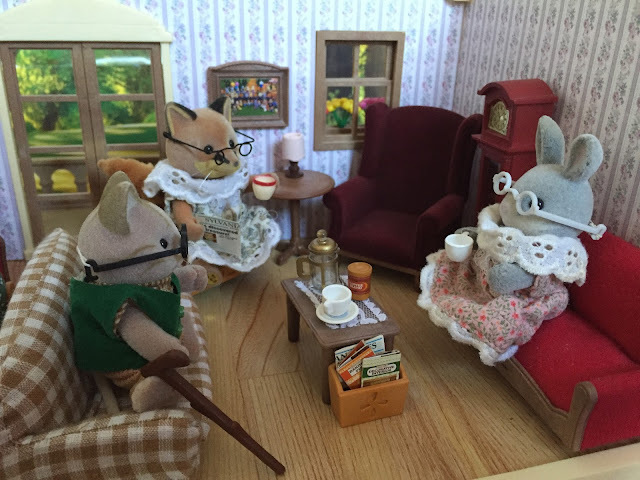 "No, I'd like to stay, I really have had the most marvellous week Margot dear" Quincy continued. "Well...well you don't know that there is space!" Margot desperately said. "I asked Mrs Hazelwood at breakfast, she's more than happy to have me" Quincy explained. 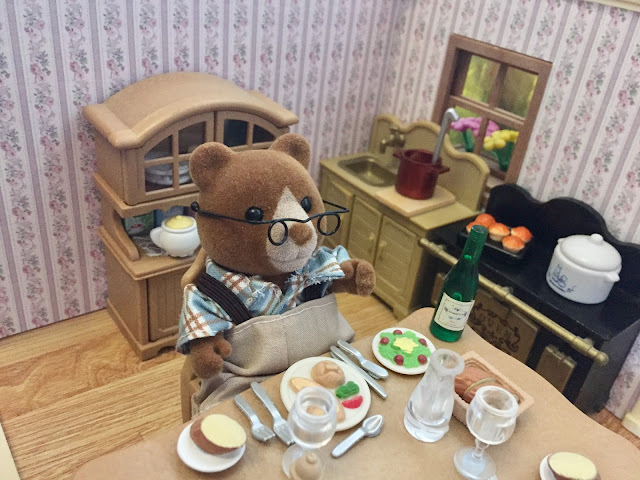 "And did you know, I get homemade biscuits here! And the most delicious food! And-"
"I don't have time to made homemade bisuits, I have four children to care for!" Margot interrupted, crossly. After a long discussion, Margot finally calmed down, and decided to accept her father's decision. He would be happier here with his friends, and it would take a lot of pressure off of Margot. As Margot Marmalade left, she wondered to herself. 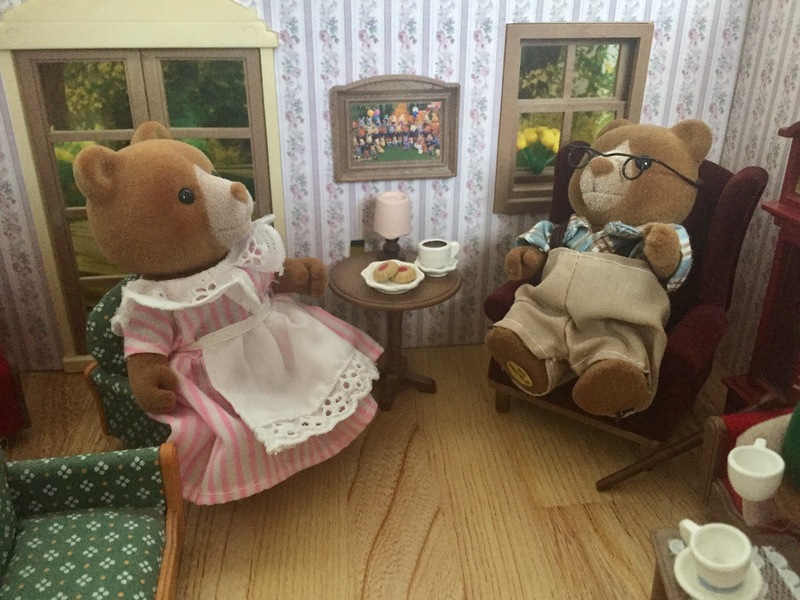 She would visit him next week with her best homemade biscuits - and no one, not even Mrs Hazelwood's would be better! After I think, nearly three years (?! ), Orchard Cottage is finally finished. To see the upstairs room and the repaint, see this post. The main reason, other than my procrastination, that it has taken me so long is that I could not decide what colour scheme to go with in the downstairs room. I would usually go for a muted floral in the kitchen/living area, but I felt with the very floral room upstairs, this room called for something different. Orchard Cottage isn't meant to be a grand home, so instead I went for a cosy theme with pale yellow. I wanted the walls to be white as this room is quite dark. 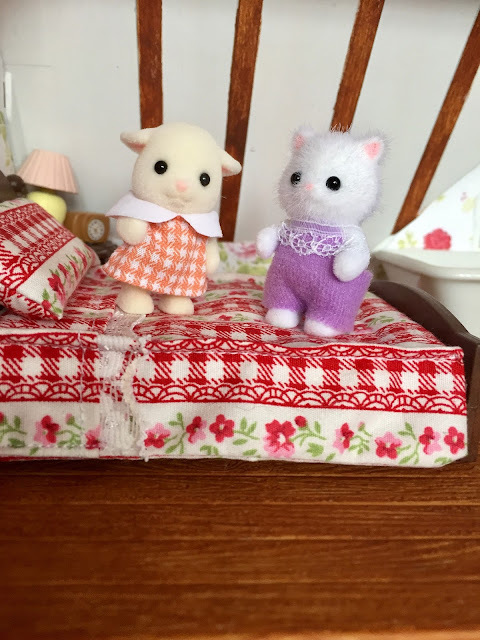 However it ended up feeling too "plain" for a traditional Sylvanian home, so I ventured into the relm of making curtains. My sewing machine has given up on me, so I had to hand stitch all of the curtains - (I do not recommend this, just these three sets took me two whole evenings!). I do think they make the home look a little more cosy though. I also painted the floor in this room as well - I just loved the colour! A lot of you have been asking who will be moving into this house...here is a few hints! 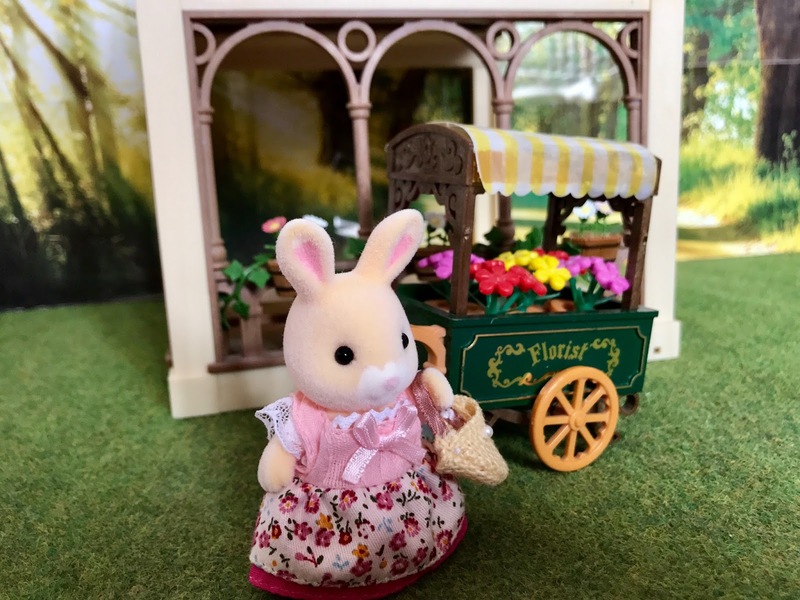 I found my old background and dollshouse grass, so I decided to take a few garden shots! This balcony with a pagoda underneath is from the Grand Mansion and I can't believe I haven't used it in pictures before. I added some flower baskets and ivy too, as I didn't really like the original flower baskets that it came with. I think I am really overdue to make a new background for pictures... this one is peeling awfully and I feel like all my blog pictures look the same with it! I am having a slight goat obsession at the moment - the Nettlefield goats are so cute but I have discovered there is a new style of goats, the Brightfield goats! 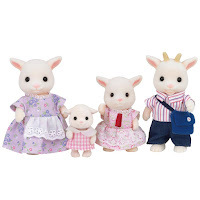 So unbelievably cute...guess who is ordering them ASAP! Really haven't been a fan of the newer Epoch UK figures but these and the Cakebread poodles have actually stolen my heart! It has all been cleared now so I can finally give my collection some love! Something I have been working on for a while is the repaint and complete redecoration of Orchard Cottage. Currently I have only finished the upper room of the home, but I thought I would share some pictures! I didn't take any proper pictures of the inside but here is the cottage all taped up before the repaint! And there is the cottage after the exterior repaint! So glad to see all the yellow gone. I painted the ceiling white and then painted the beams "wood-textured". I also painted the floor the same colour. Makes it so much more traditional and quaint! 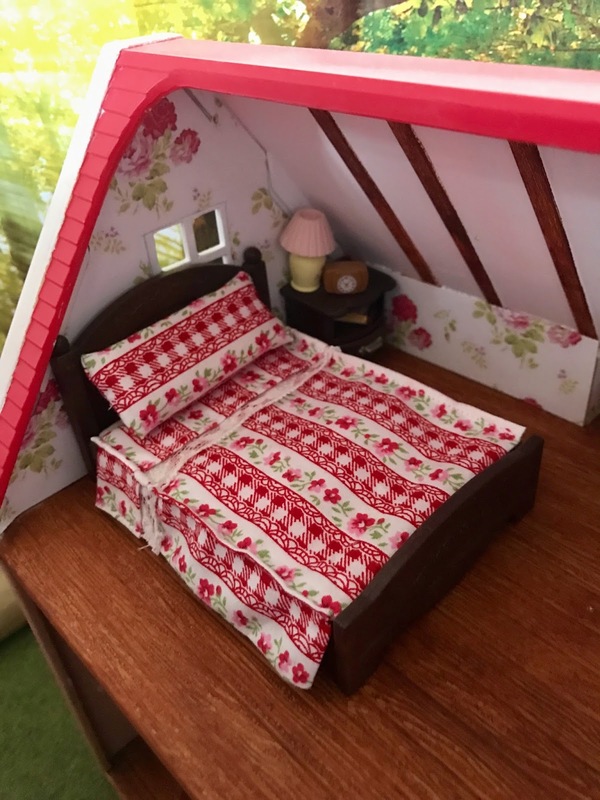 I wallpapered it in a faded-style Cath Kidston wallpaper and made new bedding for the bed as the original really didn't match the walls! 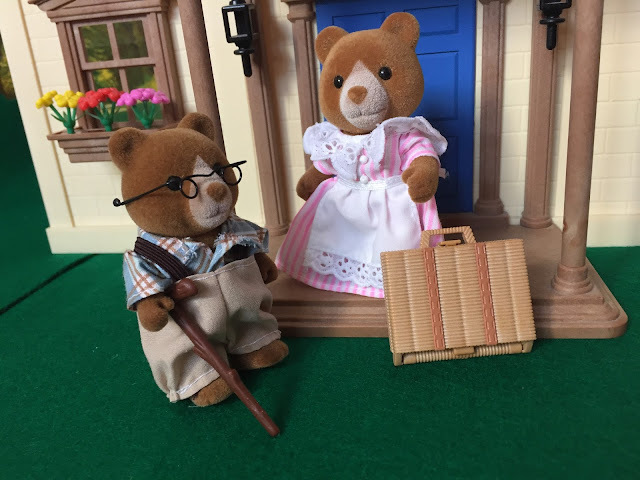 Margot Marmalade the bear stood outside Little Chestnut Care Home with her elderly father, Quincy Marmalade. "No! I refuse to be dumped in a horrible care home whilst you go off on holiday!" Exclaimed Mr Marmalade. The rest of the Marmalade family were going to the Isle of Wight for a family holiday, but Quincy Marmalade gets awfully bad sea-sickness. So it was decided Quincy would go and stay in the Care Home for the week, rather than the whole family listening to the old bear grumble on. 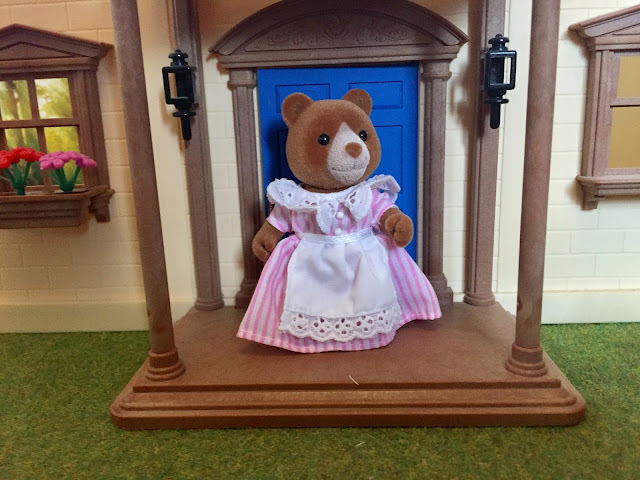 "Mrs Hazelwood will take excellent care of you, Dad. You can't just stay at home." Margot explained. Quincy Marmalade was rather wobbly on his paws nowadays, and she was worried he would take a fall. 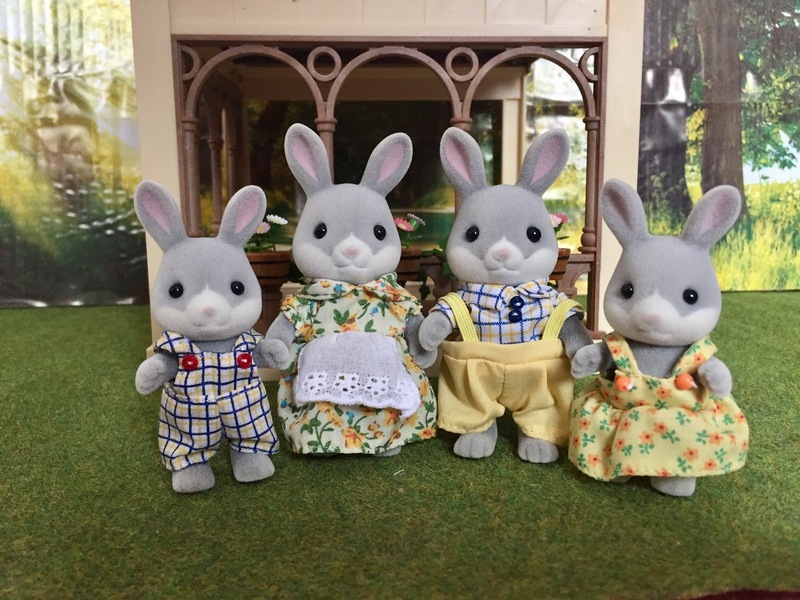 Gossip travels very quickly in Little Chestnut, and so the current residents of the Care Home were already expecting him. "I hope he's not as grumpy as I remember!" 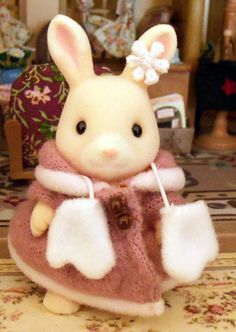 Carmen Cottontail the bunny said. 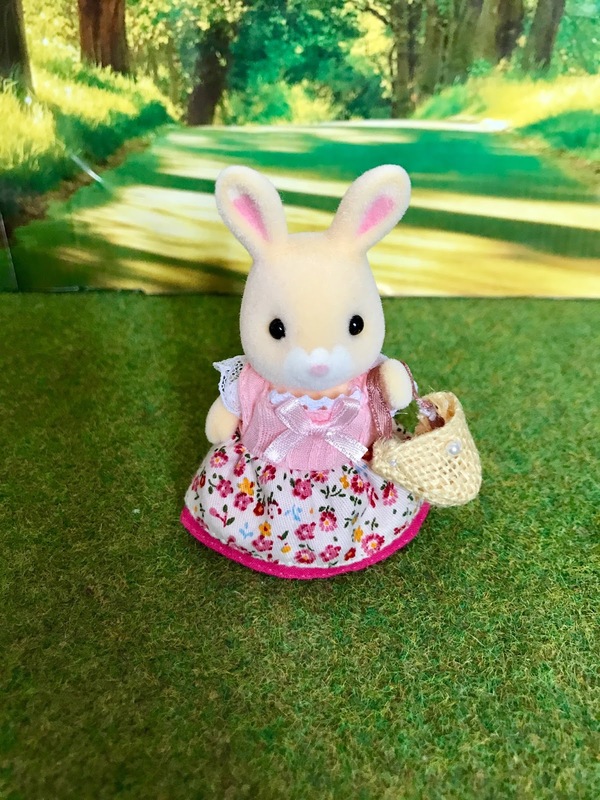 "He certainly won't like Mrs Hazelwood telling him what to do!" Mrs Renard the fox said, looking up from her newspaper. 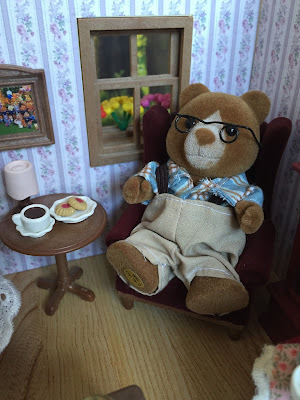 After much grumbling, and with the help of some of Mrs Hazelwood's best biscuits, Margot Marmalade managed to get Quincy settled down into a nice armchair. The main lounge in the care home consisted of a mismatch of different sofas and armchairs, newspapers and tea pots. 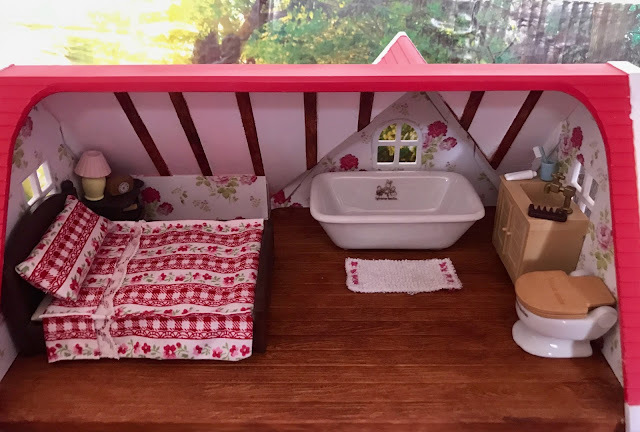 Mrs Hazelwood kept it very clean and cosy. "Is that the Sylvanian Times you're reading Mrs Renard?" Mr Marmalade said, nosily peering over. "Yes, did you know we all get a free copy everyday?" Mrs Renard explained. 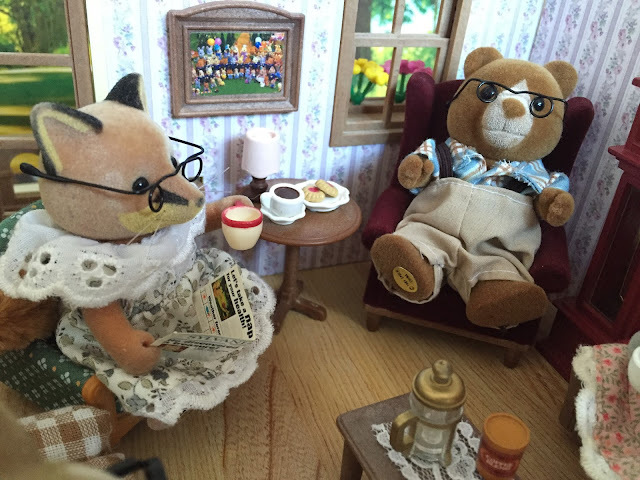 Mr Marmalade tried very hard not to look impressed by this; the Sylvanian Times was the best newspaper around. 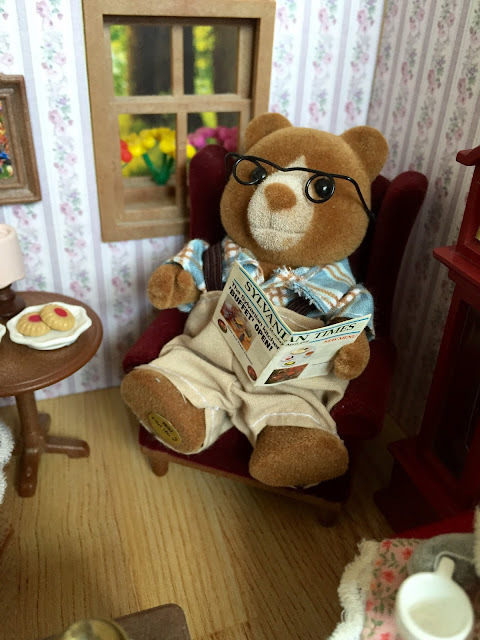 Mrs Hazelwood got him his own copy of the newspaper, refilled his tea, and gave him some more biscuits. Quincy Marmalade was very surprised to find himself almost enjoying himself! The other side of the room, Mildred Mulberry was watching television and sipping tea. 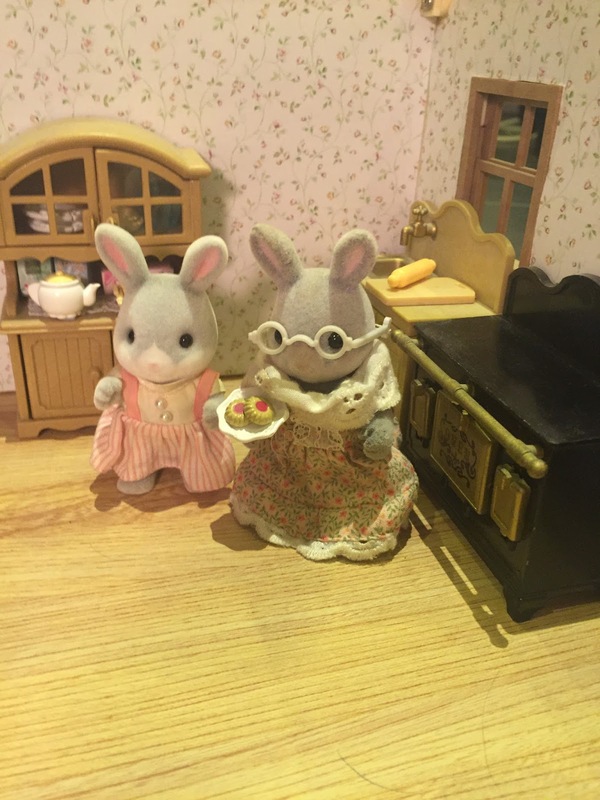 "Is that Classical Music at 6, Mildred?!" Quincy Marmalade jumped up from his armchair and bounded over to the television, completely forgetting his walking stick! 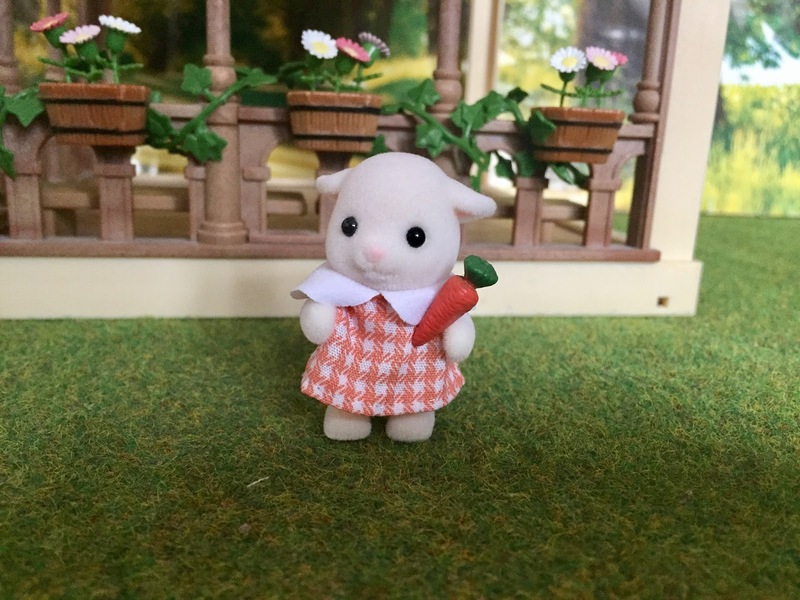 One day, Primrose Cottontail went to her Grandma and Grandad's house for the day. Grandma Cottontail wanted to make sure that Primrose had a lovely time, so she spent lots of time thinking about what they could do together. Whilst drinking her morning coffee, Grandma Cottontail was reading through her favourite baking magazine. "Baking! 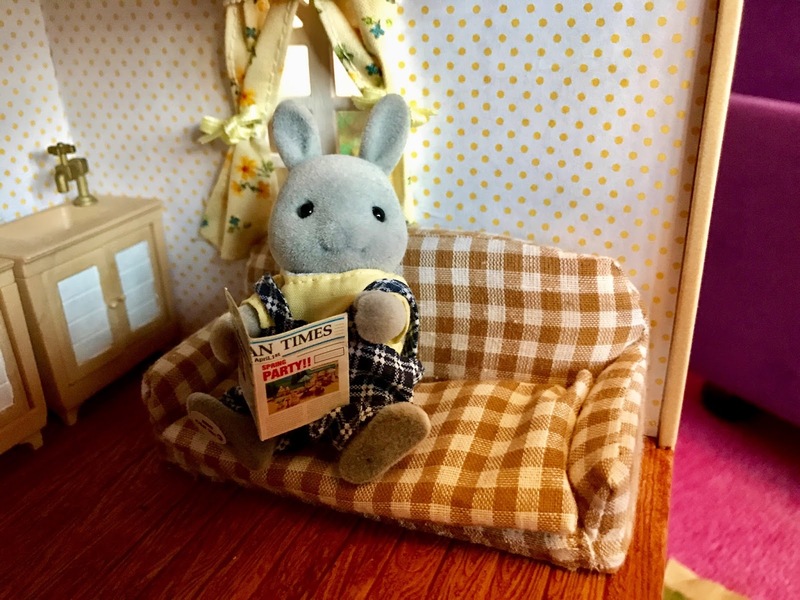 What an excellent idea," Grandma Cottontail thought to herself. "Hello Primrose my dear, would you like to bake some biscuits?" Grandma Cottontail asked. "Ooh yes please, my favourite!" Primrose beamed. "Could you whisk the eggs Primrose dear? My elbows are very stiff nowadays!" Asked Grandma Cottontail. "Of course Grandma!" Primrose laughed, as she picked up a fork. 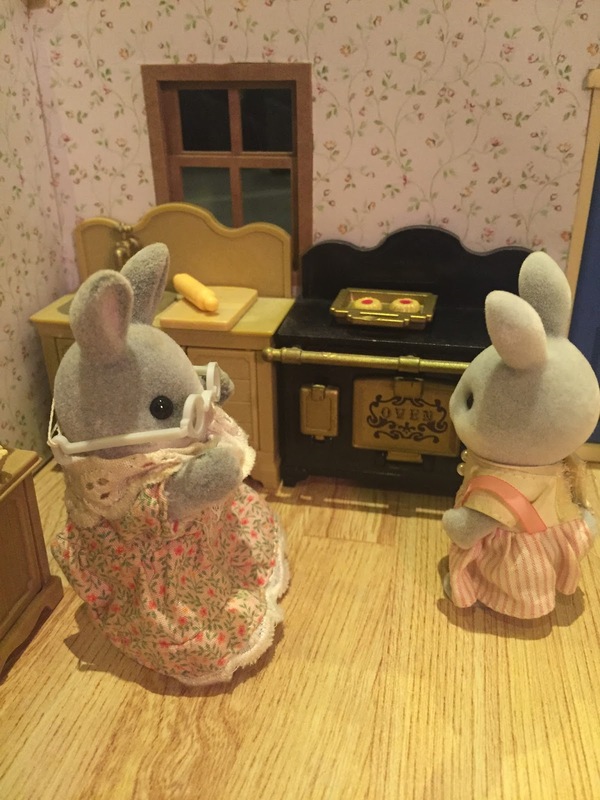 After a lot of giggles and messy flour, they put the biscuits in the oven to cook. "These smell delicious!" 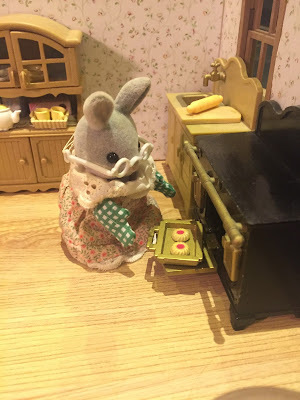 Grandma Cottontail said, getting them out of the oven. "And they look like they'll taste delicious too.." Primrose put her paw out to take one. 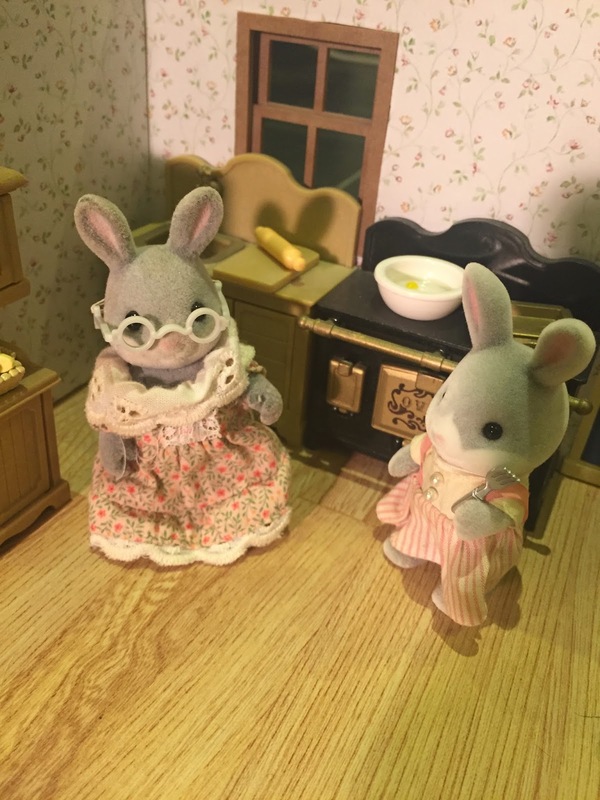 "No not yet my dear! 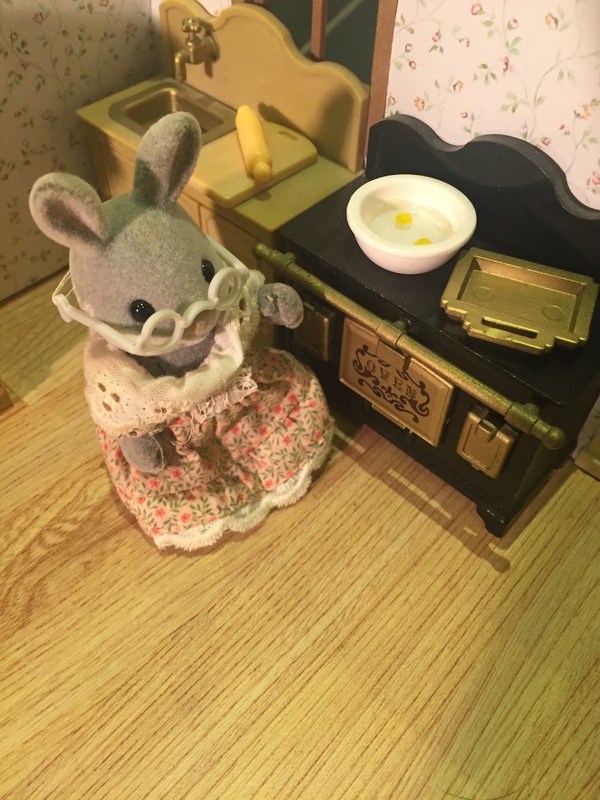 You'll fry your whiskers if you eat that! 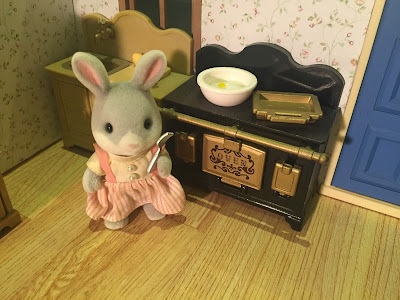 Let them cool down first," Exclaimed Grandma Cottontail. 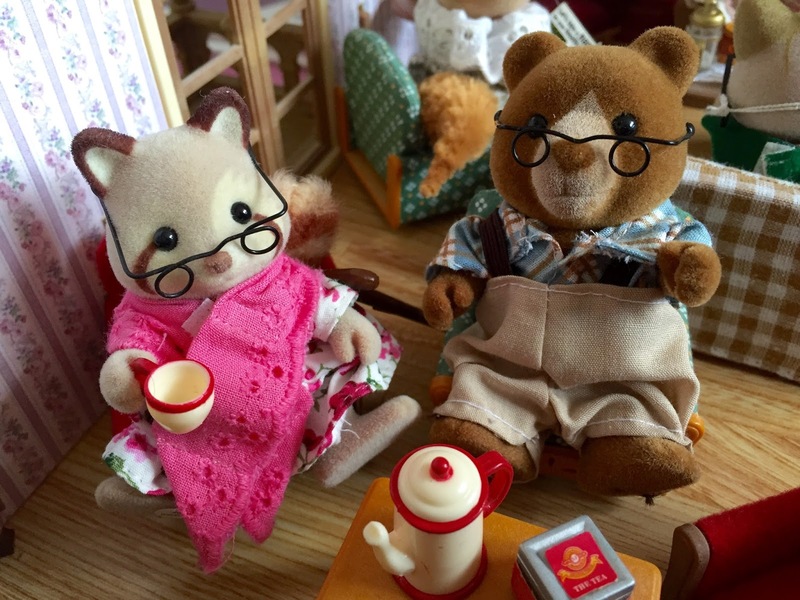 Primrose grumbled to herself before finally agreeing she did quite like her whiskers the way they were already. Finally the biscuits had cooled down, and Primrose helped her Grandma arrange them on one of her best plates. 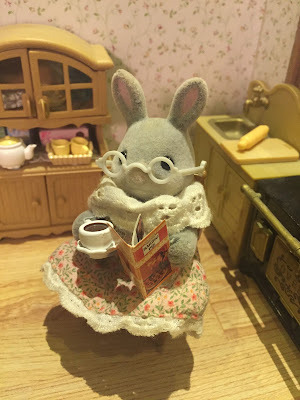 "Hmm," Wondered Grandma Cottontail. 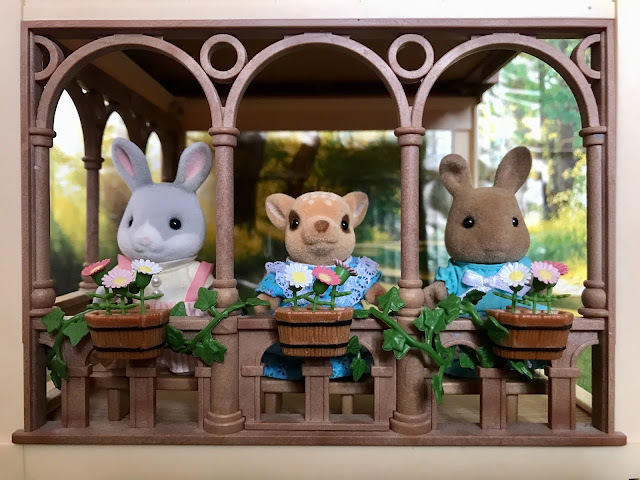 "I wonder who else would like one of these biscuits..."
Sylvanian Families are little woodland creature figures who live in a variety of houses filled with miniature furniture. Sylvanian Families are the same as the American Calico Critters. 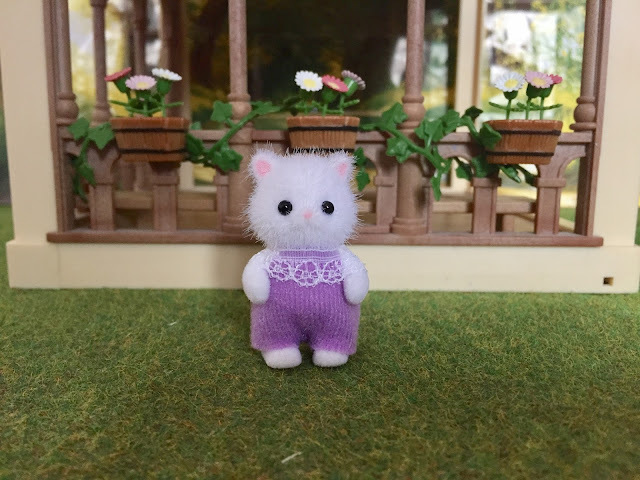 Want to know every time there's a new post up? Sign up quickly and easily for email updates below. You'll never miss a post again. Please ask my permission before using any content or images of mine. Travel theme. Powered by Blogger.